The Pinarello Dogma K8-S is a road bike with rear suspension that really does make a big difference to the character of the ride, taking the edge off uneven surfaces and softening the impact of larger lumps and bumps. You know all about the Dogma, right? 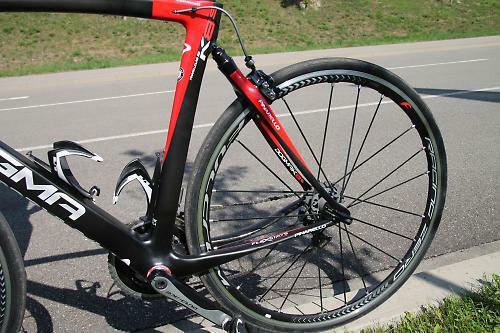 The Dogma F8 is the bike that Chris Froome rode to victory in the Tour de France last month. Then there’s the Dogma F8 Disk that Team Sky raced for the first time in the Eneco Tour a couple of weeks ago. 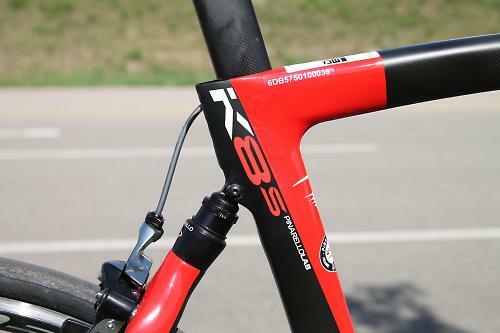 The Dogma K8-S is very different from either of those two in that it features rear suspension – what Pinarello calls a DSS 1.0 shock between the seatstays and the seat tube with travel that relies on flex in the chainstays. 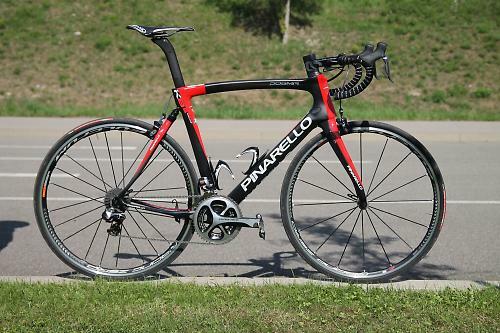 We first showed you the Pinarello Dogma K8-S when it was lauched back in April. 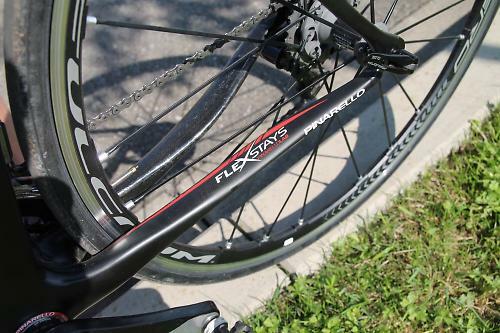 Why would you want to complicate a road bike by adding suspension? The idea is to provide a smoother ride over dodgy surfaces. In the case of the pros, that could make a difference in races that involve cobbles, like Paris-Roubaix. According to Pinarello, “The Dogma K8-S is the result of a specific request of Team Sky: to have an innovative frame able to reduce the psycho-physical stress of the athletes, and thus increase the performance in the Hell of the North. Great use of some of cycling’s best loved clichés there! Pinarello's use of the phrase 'pivot point' is a little confusing. There are no pivots; the chainstays flex enough for the shock to compress, like you see on a soft-tail mountain bike (there’s nothing new under the sun!). Pinarello says that the front triangle of the Dogma K8-S is very similar to that of the Dogma F8 with just a slightly altered geometry. Pinarello claims that the frame, complete with suspension, weighs 990g (53cm model), and that it improves rider comfort by as much as 50%. For the full tech background to the bike, check out our original story from the launch. I must say that the whole K8-S story set the klaxons on my BS detector blasting out at 150 decibels. 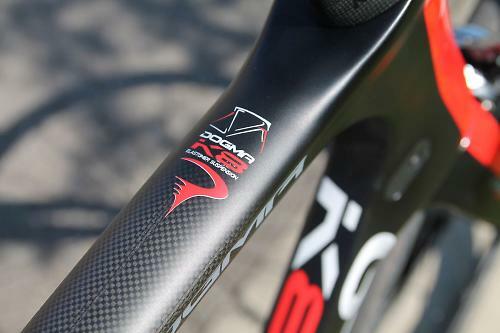 I mean, “The overall performance of Dogma K8-S is 4.6% greater than Dogma K 2015, in terms of handling and comfort”. What are you supposed to make of a claim like that? 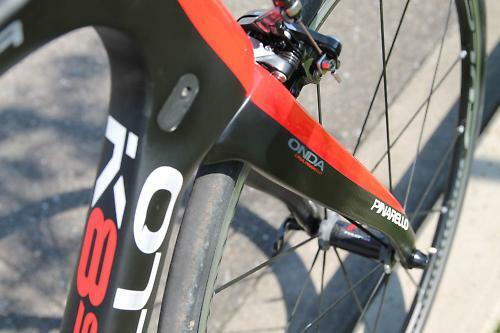 But I got the chance to go for a ride on the Dogma K8-S and I must say that it does do what Pinarello claims. I started out riding it over the bumpiest bits of asphalt that I could find, then hitting all the drains and manhole covers in Friedrichshafen. You feel this stuff, but not as much as normal on a road bike. That got me searching for badly surfaced roads. There are a bunch of gravel roads around here; you know the sort of thing – holes, bumps, the occasionally bit of mud. 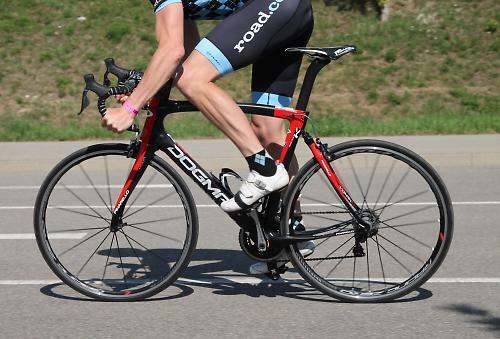 The Dogma K8-S smooths them over. Not at the front, obviously, because there’s no suspension in the fork, but the ride is appreciably softer at the back. There’s really not a whole lot of travel on offer here. We’re talking about a few millimetres. That’s not much but it’s enough to affect the ride. I was genuinely surprised. It’s the difference between getting shaken up and down in the saddle on a gravel road (I couldn’t find any cobbles), and feeling more comfortable and in control. Significant. 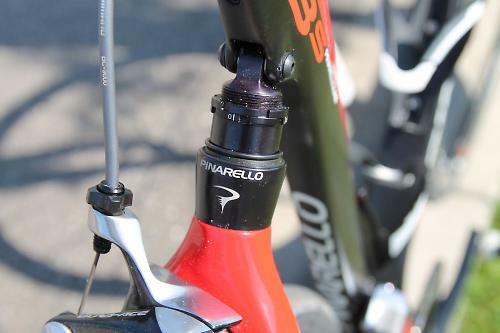 What cutting-edge suspension medium is Pinarello using here? Um, elastomer. If you’re from a mountain bike background you’ll know that this is a material that was used for off-road suspension back in the days when Queen Victoria first got phat air on the Windsor Castle doubles. You’ll be scoffing at these roadies for slinging it on the back-end of a high-end carbon frame. But what can I say? Okay, it’s not the most sophisticated system ever and I didn’t have a particularly long time aboard the Dogma K8-S, but it felt good on my ride through the woods (yes, I know the pics are on the road). The Dogma K8-S feels nippy and alive too. The 58cm model I rode weighed in at 7.46kg (16.4lb). That’s pretty light, even though the shock adds a little weight, of course (there’s no such thing as a free lunch!). The bike accelerates well and you can chuck it around easily when you get out of the saddle. Downsides? Well, I did find that the back end would move a bit when sprinting out of the saddle, giving the Dogma K8-S a bit of a squidgy feel in that situation. But, on the whole, I think the bike is successful in that it delivers a smoother ride across rough roads. It isn’t a gimmick. The riding you do might or might not benefit from a bike of this type, but I’d certainly love to give it a go over the cobbles.